Quick And Easy Kale Recipes The Complete Guide to Using the Superfood Kale to Make Great Meals A lot of people may wonder what the big deal is about kale as it has become quite a popular choice for many in recent years. 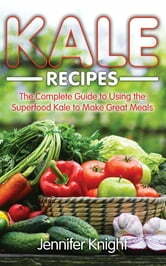 This book can help the reader to understand kale even more. The book is "Quick And Easy Kale Recipes" and through the author, the reader not only gets to learn why kale is such a great meal option but how to prepare sumptuous meals using this great Superfood. The meals are not only tasty and healthy but are pretty easy to prepare. In our fast paced society it is important to find the best way to get the most healthy and nutritious meal while on the go. The author is aware of this and highlights some great soups and drinks that take no time to put together. The menus are not rigid and the reader can experiment with the taste until they get it to suit their palate. About Jennifer Knight Jennifer Knight knows what it is to live a healthy life. This book focuses on one of her favorite Superfoods. This is kale. Kale has made some resurgence in the past few years as people seek ways to eat healthy and Jennifer is more than aware of what that means. Kale is a pretty versatile superfood and through Jennifer's book we get to learn some of the many ways that it can be used to create a fantastic meal, bit it breakfast, lunch, dinner or snack.